Bowls from Lowell-based glassblower Aron Leaman. Spend the first weekend of spring in Paradise. The Paradise City Arts Festival that is. 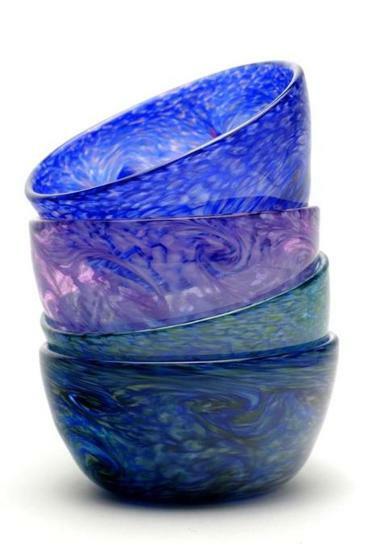 In its 19th year, the fair draws some of the area’s most talented artisans, such as Lowell-based glassblower Aron Leaman, whose colorful, swirling bowls ($54 each and four for $200) are gorgeous and functional. Among the 175 exhibitors are ceramicists, fiber artists, jewelry makers, furniture makers, painters, sculptors, and more. There’s live music each day too, as well as artist demonstrations. If you miss this round, or need another fix, the festival regroups in Northampton in May.